This week, my guest is Samantha Bates, co-founder of #TNedchat and organizer of Edcamp Tennessee. Doug Robertson @theweirdteacher, connected me with Samantha, and I am so glad he did. Samantha shares her insights in organizing the Edcamp in Tennessee. I found this to be very interesting, since I am such a believer in the Edcamp idea. In fact, I’m looking to attend an Edcamp in my area. I love the idea of teachers sharing best practices and ideas from each other. Samantha shares that being yourself, being thoughtful and being flexible are the qualities that she finds in amazing teachers. 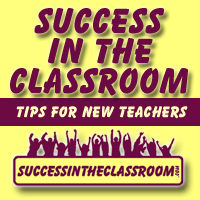 When it came to classroom management, Samantha encourages new teachers to know who they want to be and know what they want their students to do. She cautions teachers to not try to be like other teachers if it’s not who they are. Her most amazing advice came when I asked her about the one piece of advice she would offer to new teachers. 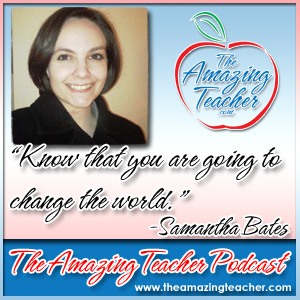 She states, “Know that you are going to change the world.” In a time when many are criticizing education, Samantha reminds teachers that this is an exciting time in education. I had an amazing time speaking with Samantha, and I know that you will find great value in what she shares as well. Thank you again for spreading the word about the podcast. You can follow the new Amazing Teacher Podcast Twitter account here: @AmazingPodcast.